Rowing is the one of the most graceful, mentally and physically beneficial, life-long sports. With the advent of the recreational rowing shell, it is no longer just an exclusive, collegiate or Olympic sport. With rowing clubs appearing along waterways all over the country and the world, rowing is one of the fastest growing sports. The US women have excelled in the Olympics, winning gold medals in 3 consecutive Olympics. Rowing uses all the major muscle groups and is low-impact, and highly aerobic, much like cross country skiing. 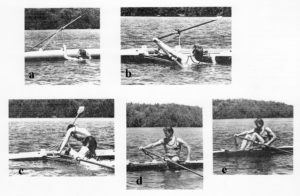 Although it uses the upper body, the strength of the rowing stroke comes from the legs. Rowing attracts a wide range of age groups. Rowers between the ages of 7 and 90 have been known to compete in local and/or international regattas. Many middle schools, high schools, and most colleges have rowing/crew programs. There are collegiate scholarship opportunities in crew, and many colleges are now recruiting from high school and club programs. Adaptive rowing is also enjoyed by differently-abled athletes, and is a Paralympic sport. Rowing requires you to be relatively physically fit and flexible. You have to be able to get in and out of a shell from the dock, or beach launch from the shore. You should be able to get back into a boat; should you flip; requiring arm strength to lift yourself into the boat. You should be able to swim and tread water. Getting Back into the shell if you flip. Video of flipping and getting back in.